Up until today, if you wanted to use the voice call feature on the Android version of messaging app WhatsApp, you had to receive a call from someone who already had the feature. But we received a screenshot from one of our loyal readers today that revealed the result of an update to the Android version of the app. As you can see, some changes have been made. Instead of the Chats and Contacts tabs, a third new option has been added. Titled "Calls," when that tab is opened, users tap on the new call icon at the top of the screen. That begins the process of making a call to a person on the contacts list that has WhatsApp on his phone. Hopefully, this means that those with the Android version of WhatsApp are able to make calls without having to jump through hoops. Just a few days ago, we told you that iOS users of WhatsApp are just weeks away from being able to make calls on the app. Right now, you need to have a jailbroken iPhone to enable the voice call feature for the platform. It seems like ages since we first started down this long road toward voice calling on WhatsApp. Truthfully, we can now see the finish line in sight. Yup got this today! Woke up in the morning to find that it has been updated. Anyone having problem with their microphone not working in Whatsapp calls? I can hear other people just fine but they can't hear the word I say. It's working fine in other apps like regular calling or voice-typing. Any way to disable it ? Don't like the pop-up box when pressing someone's photo... And I do not like Facebook to record my calls, so when I press 'call' I want my phone-app to open, not the whatsapp call function. Settings-Apps-WhatsApp-launch by default. Clear the launch by default. So the call function should ask you which app to use. 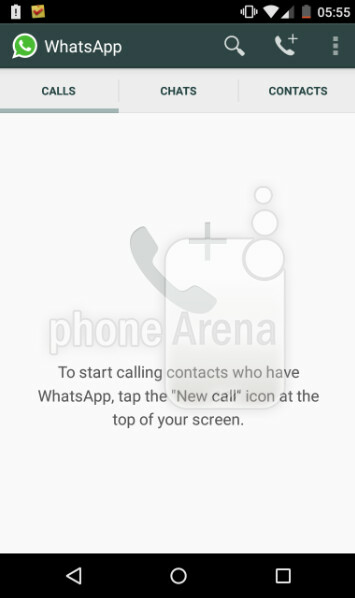 If you are launching the call inside WhatsApp,I think this will just be the app functioning properly making the call itself. By outside of the app. You can default it to your phone dialer. Have you read the EUL for that app? I dont like new Whatsappo IU. what about us, windows phone users :( , every update has to come last to this platform.